The Chank Company is a Minneapolis-based type house and art studio, named for president and CEO Chank Diesel who began making fonts in 1992. Chank Fonts were featured in the Smithsonian’s Cooper-Hewitt National Design Museum as “important examples of contemporary typography” in 1996. And in 1997, Chank was profiled in The Wall Street Journal, complete with etched portrait. 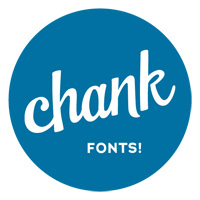 Chank strives to make fonts fun and accessible for both the average computer user and professional designers, with original experimental free fonts and affordable trend-setting commercial fonts. Chank also creates custom fonts for companies who want exclusive rights and a specific design for a typeface. Clients who have used Chank’s custom font services include BBDO-NY, Cartoon Network, Huggies, Pizza Hut, Scholastic Books, Simon & Schuster, Target, Walt Disney and many more.